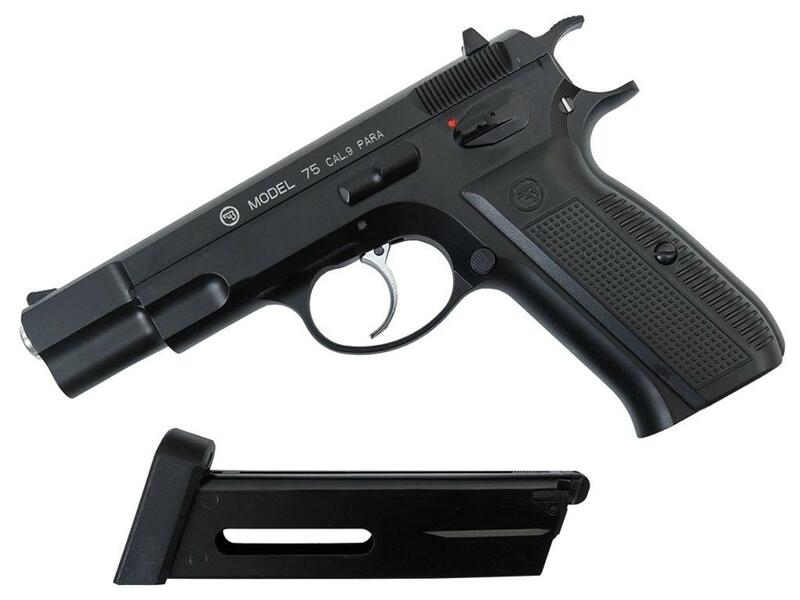 ASG CZ 75 GBB Full Metal BB Pistol | ReplicaAirguns.ca | Easter Weekend Sale! 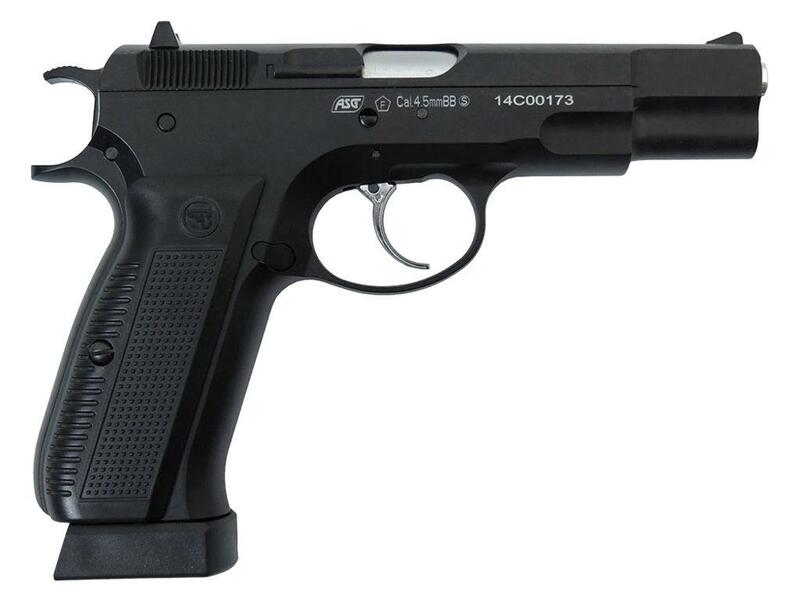 Trigger Pull: I would like to see just a bit higher fps from the ASG CZ 75 CO2 Blowback BB Pistol, that would also give it a little bit more blowback kick but even the 300-ish fps out of the box, the ASG CZ 75 is a really nice pistol to shoot with its super responsive trigger! Accuracy: Stepping back 30 feet and shooting at my paper target, the ASG CZ 75 CO2 Blowback BB Pistol produced a decent 2-2.5 inch 10 shot grouping that was just a little to the left and a hair low. The trigger is super light and the release is crisp, I actually had to get a bit used to how light the trigger was as I was shooting a bit early and before I was ready since only a slight bit of pressure is required. Comments: In terms of velocity the ASG CZ 75 BB Pistol shoot fairly conservative at just under 300fps. 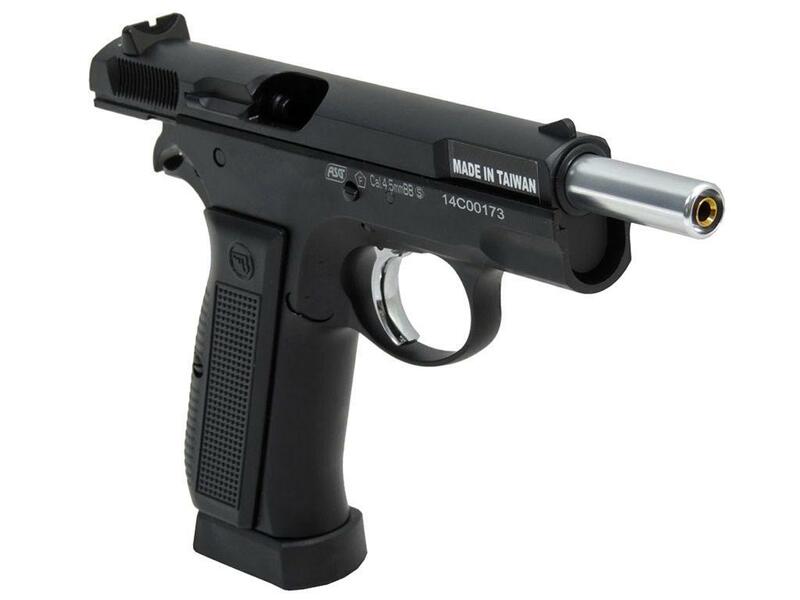 The noise this CO2 Licensed Replica Pistol makes is fairly quiet making it a good choice for the backyard if you have neighbors to consider. I also found the blowback to be mild since the amount of CO2 being released with each shot seems to be minimal. 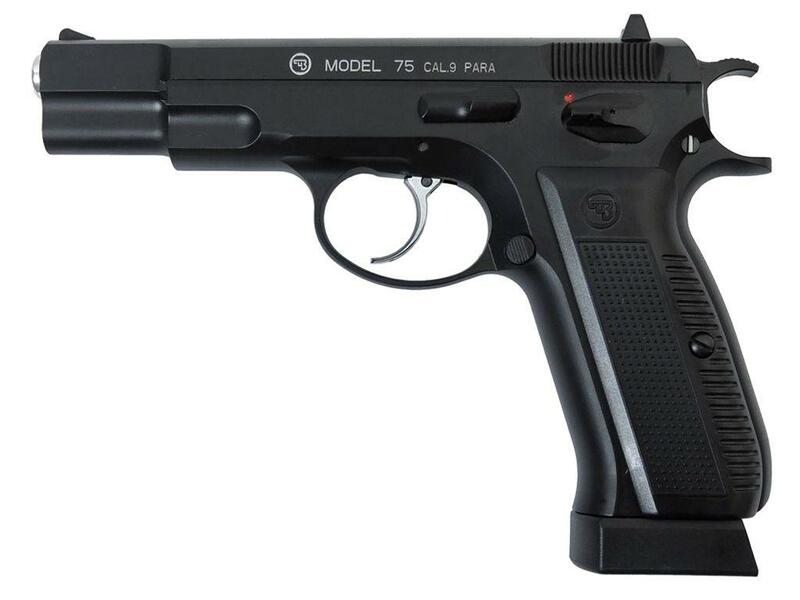 This is my Official Field Test Shooting Review video for the ASG CZ 75 CO2 Blowback BB Pistol. You can also checkout my Field Test for the KJWorks Airsoft Version which by the way is pretty much the exact same Pistol but in 6mm Airsoft and distributed by KJWorks rather than ASG. In this Field Test Shooting video I test out the performance of the ASG CZ 75 CO2 Blowback 4.5mm BB Pistol using my Chronograph to get a real world Feet Per Second rating, I also position myself 30 feet back and shoot 10 rounds at a paper target using a semi-rested shooting position (Sand bag up front and standing in the back). In terms of velocity the ASG CZ 75 BB Pistol shoot fairly conservative at just under 300fps. 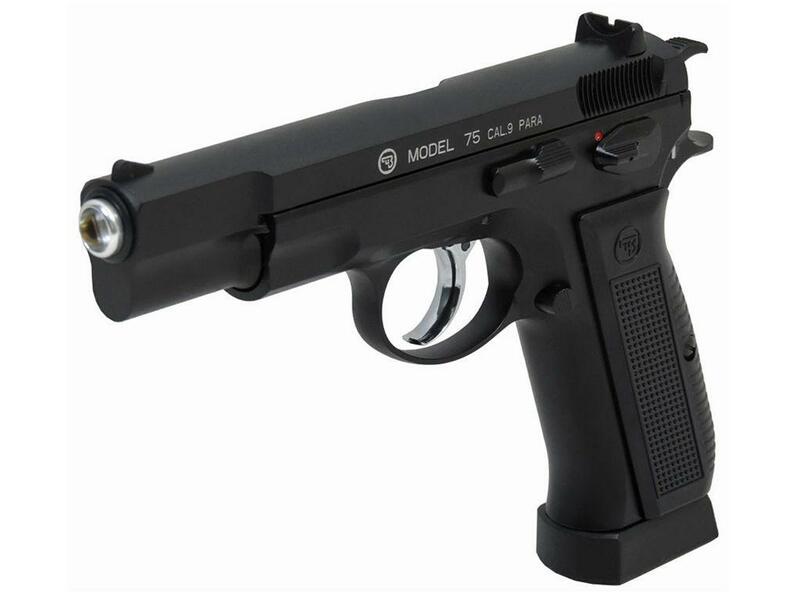 The noise this CO2 Licensed Replica Pistol makes is fairly quiet making it a good choice for the backyard if you have neighbors to consider. I also found the blowback to be mild since the amount of CO2 being released with each shot seems to be minimal. Stepping back 30 feet and shooting at my paper target, the ASG CZ 75 CO2 Blowback BB Pistol produced a decent 2-2.5 inch 10 shot grouping that was just a little to the left and a hair low. The trigger is super light and the release is crisp, I actually had to get a bit used to how light the trigger was as I was shooting a bit early and before I was ready since only a slight bit of pressure is required. I would like to see just a bit higher fps from the ASG CZ 75 CO2 Blowback BB Pistol, that would also give it a little bit more blowback kick but even the 300-ish fps out of the box, the ASG CZ 75 is a really nice pistol to shoot with it's super responsive trigger!